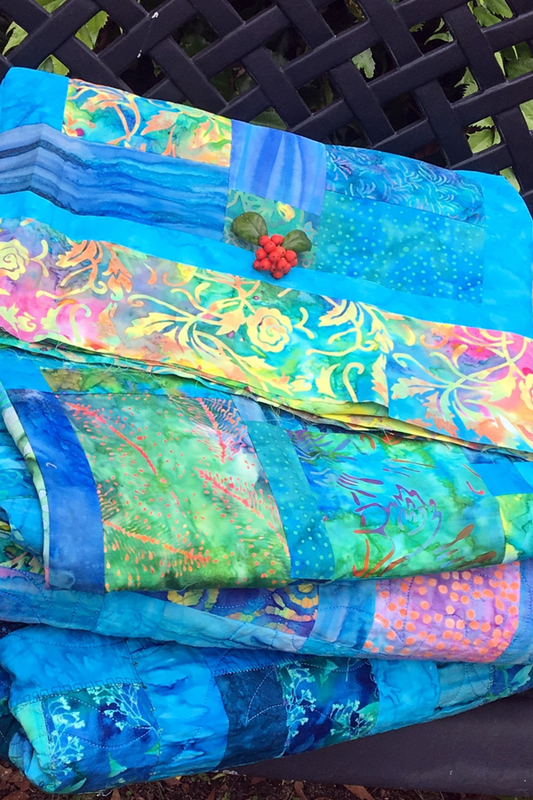 There is great happiness in acquiring a beautiful fabric stash, as any quilter can attest to. Just pulling out a few pieces to look at will brighten your day. These are the fabrics that called to you from afar with inspirational promises. Gorgeous fabrics that you couldn’t leave behind. Fabrics you must have in your possession! Well, it’s time to put your stash to good use and create something stunning. Stash Quilting is my new approach to quilting. In addition to a sizable pile of stash fabric, you probably have a collection of fat quarters, too, not to mention a bag of scraps from prior projects. Stash quilting meshes these glorious treasure troves to transform your next quilt into a showstopper. Pull together all your scraps along with your coveted stash and fat quarters to see what magic happens. Beautiful color combinations will emerge. Before you know it, you’ll have more ideas than you can even begin to sew. Let your imagination go and get creative with Stash Quilting! 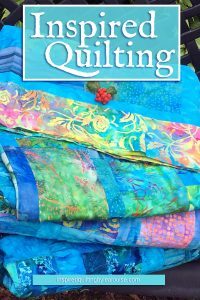 Stash Quilting is creative and an easy, economical approach to quilting. Best of all, it’s totally liberating! Since I opened my pandora’s box of quilting, I haven’t looked back. Stash Quilting has been a new method for me that has completely energized my personal quilting style. Initially, I just wanted to use the fabric I’d been collecting. Instead, my Stash Quilting technique has been an incredibly creative journey. I love that I can save money and make beautiful, new quilts using my stash fabric! That’s a huge win for me. Stash Quilting simply adds a new direction to quilting that broadens your abilities and creative ideas. Stash Quilting offers a great option to use scrap fabrics. After making hundreds of quilts, I maintain a very healthy scrap pile. All my early scrap quilts were filled with tidy little strips and squares. Some were surrounded by lattice while others were simply joined together. Making each one brought back so many memories of the quilts I’d previously made. Especially heartfelt is the story behind each one. Whether it was the person the quilt was made for, where the fabric was acquired, or how the pattern was developed, I love each of them. Stash Quilting combines the incredible versatility of scrap quilts along with those stash fabrics that you love. This magic combination makes them great fun to create. Particularly so for me since I usually work with such similar colors schemes. I enjoy using the remaining bits of my favorite fabrics, mixing in a wide assortment of other colors to create a completely new design. The color palette of my finished stash quilts often surprises even me because it’s much more vibrant than my usual choice. My Stash Quilting process is easy. Simply use what you already have on hand with a more creative approach. Draw from both your scrap bag and stash fabric piles to create a beautiful color arrangement. While your scrap bag is filled with bits and pieces from past projects, it’s your stash pile of yardage, fat quarters and pre-cuts that are calling to you! Use these fabric sources together and start sewing blocks into uniform sizes. Soon you’ll have enough to assemble a quilt top. It’s a stimulating process that provides great imaginative opportunities. Generally, when I’m selecting fabric for a new Stash Quilting project, there’s one fabric I’m focused on. This focal fabric sets my design direction and I pull in other colors that compliment that piece. My best and easiest recommendation for choosing fabrics is to select a favorite piece you love, and match from there. Designers invest a lot of time and effort to create pleasing prints. Use their expertise by pulling from the color schemes in your focal fabric. Using similar colors brings an appealing, cohesive look to your quilt. Then you can add according to your personal preferences. Let me tell you how I pull fabric together for a quilt project. Every Stash Quilt I make starts with a fabric pile. First on the pile is that piece that calls to me when I’m ready to make a new quilt. It becomes my guide for fabric selection. I always have an assortment of yardage waiting to be sewn into something spectacular. Working with fabric creates some very strong emotions in me. When I see a piece that I love, I get excited and the ideas are jumping around my head. Even though that fabric may not have done anything for me yesterday, it’s at the top of today’s choices. My fabric stash pile technique is important for me. I can be anywhere with a bit of room to spread out. Maybe that’s why I like cream colored bedspreads because it makes a great background for staging fabric! With my focal fabric front and center, I add more yardage pieces that catch my eye on the pile. It all depends on what I have on hand to work with. Now, with my primary fabrics selected, I’m ready to bring in more color, patterns and design. The secret to a great stash quilt is to use all those scraps along with the bits and pieces left over from other projects. My scrap pile provides the extra fabric that adds more interest to my quilt. I love random fabric pieces that add visual elements. Use these little bits to bring in bright spots of contrasting color or bold patterns, and even some tonal pieces to bring it all together. This selection process is where you can add the pop that makes your quilt really stand out. Let Stash Quilting be anything you want it to be. There are plenty of scrap quilt styles to get ideas from. 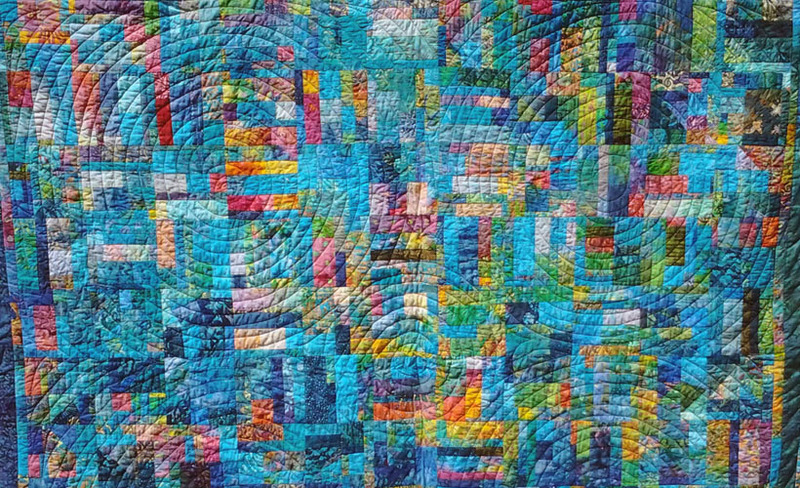 Your quilt can be lots of connecting squares, or random pieces sewn into strips that form larger geometric shapes. Perhaps you want to play with light and dark colors to create a dynamic design. Ultimately, you use what you have on hand to make something beautiful that pleases you. Yes, you’re even allowed to buy some extra fabric if you want. Remember, these are only guidelines to get you started. Once you find your rhythm, keep on going and quilt to your heart’s content!